Elizabeth C. “Helen” Pasternak (nee Tokarczyk), 94, of Lorain, died peacefully on Saturday September 1, 2018 at Ames Family Hospice House in Westlake. 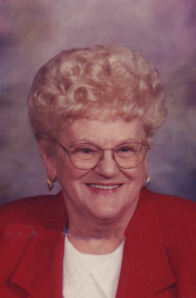 She was born October 27, 1923 in Lorain and was a lifelong resident of Lorain. Helen worked in the cafeteria at Admiral King High School in Lorain. She was previously employed by George Canalos wholesalers. She was an active member of Nativity BVM Catholic Church in Lorain, a member and past officer of the church Altar & Rosary Society, a member of PLAV Post #38 Ladies Auxiliary, St. Mary Magdalene Branch #77, US Steel Golden Age Pensioners, the National Council of Catholic Women and the School Employee Retirees. Helen enjoyed baking nut roll, traveling with the St Anthony Paduan Travelers and having garage sales. She is survived by her children: Barbara (John) Franko of Lorain, Elaine (Peter) Rahotina of Sheffield Village and Stephen T. (Patty) Pasternak of Amherst Township; grandchildren: Ronald A. (Sherry) Campana, Alicia (Chris) Cajka, Cory (Megan) Pasternak and Ashley (Benjamin) Langford; step-granddaughter Wendy Smith; step great grandchildren: Tina (CJ) Pauley, Alaina Smith & Alexander Smith and 2 expectant great grandchildren: Baby Pasternak and Baby Langford. She was preceded in death by her husband Steve Pasternak in 1985, parents Joseph & Anna Tokarczyk (nee Jakubowski), grandson Jason Rahotina in 1998, brothers: Joseph, Stanley, Frank & Ted Tokarczyk and sisters: Mary Walczak, Josephine Keller and Theresa Pasternak. The family will receive friends Wednesday September 5th from 4:00-8:00 pm at the Gluvna-Shimo-Hromada Funeral Chapel, 3224 Broadway Ave, Lorain. Additional viewing will be held Thursday September 6th from 9:30 am until the time of the mass of Christian Burial at 10:00 am at Nativity of the Blessed Virgin Mary Catholic Church, 1454 Lexington Ave, Lorain. Helen’s nephew, The Rev. Gerald Keller, and the Rev. Robert J. Glepko, pastor, will concelebrate. Burial will follow at Calvary Cemetery in Lorain. Ames Family Hospice House, 30080 Hospice Way, Westlake, OH. 44145 or St Jude Children’s Hospital, 501 St Jude Pl, Memphis, TN, 38105.